It's the highest quality impervious trauma/oxygen bag on the market today. The outer shell is constructed of 14oz vinyl. 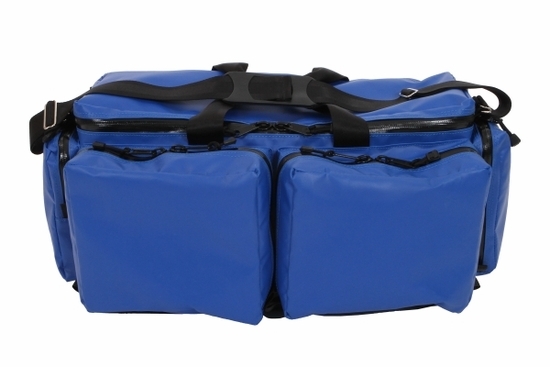 The interior liner is constructed of nylon pack cloth and high density foam for equipment protection and stability. Dividers are fully adjustable and secured in place with hook and loop. Both the dividers and the liner may be removed for cleaning. Hand wash with mild soap and water, allow to air dry. It holds a "D" or Jumbo "D" oxygen cylinder with access to the regulator through the end pocket. The molded TUFF Bottom provides a nearly indestructible base. Four outside pockets surround the main compartment. There are two pockets on the front that have multiple elastic loops and slot pockets. Inside the lid is a large Aquaguard zippered pocket. YKK #10 heavy duty Aquaguard water resistant zippers are used throughout the bag. The zippers are reversed to eliminate wear on the coil prolonging the life of the strongest zipper on the market. 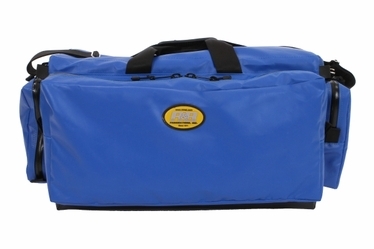 The Aquaguard zipper has a polyurethane coating to lock out dirt and moisture. 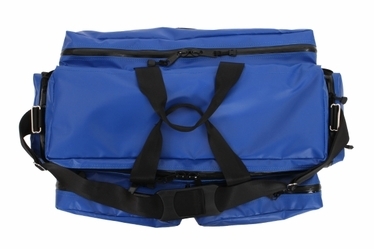 It comes with an adjustable nylon shoulder strap.